Benromach 15 Years Old is aged in a combination of bourbon and sherry casks. Luscious and rich with notes of fruit cake, plums and cocoa. The Benromach 15 Years Old is matured in a selection of Bourbon and Sherry casks, resulting in an intense but balanced flavour profile. There are a lot of spices (ginger, mint and a little sprinkle of cinnamon), there's juicy fruit (plum and clementine), there's a touch of smoky charred oak - all well placed and in harmony with each other. The longer maturation softens its smokiness to hints of charred smoke while developing the wood imbued with succulent honey, vanilla and fruit. Born in 1898, the distillery is now managed by three distillers. At Benromach, they handcraft their whisky and make it slowly, the time-honoured way. The whisky is made the old fashioned way that is pre-1960s for a typical Speyside result : beautifully balanced with a light touch of smoke. Before the mid-1960s, Speyside distilleries malted their own barley. They would top up their fires with cuts of local peat when coal was running low. These slices were enough to impart a touch of smoke in the region’s whisky. And, with the advent of new commercial maltings in the 1960s, this subtle Speyside smokiness got lost. 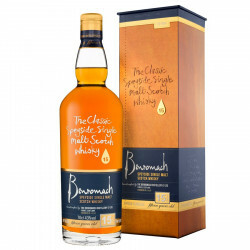 But Benromach Distillery brought back this lost style of whisky. It’s not just the peat that makes the difference. 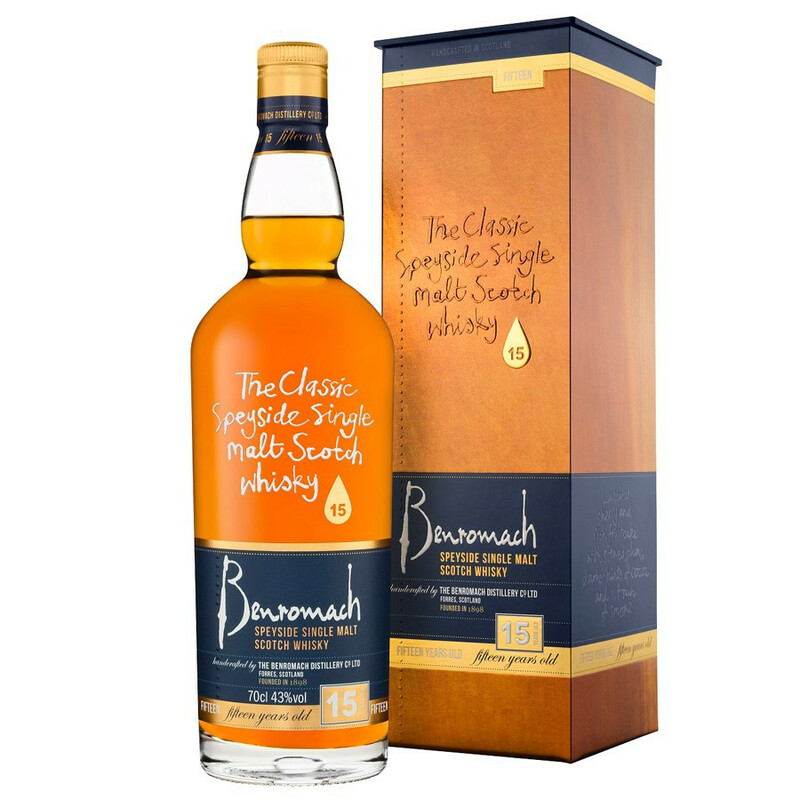 Numerous nuances go into creating the classic character of Benromach. Their Scottish barley is grown locally and malted with a little peat smoke to their exact specifications. Pure soft water rises in the Chapelton Spring in the Romach Hills, just a couple of miles behind the distillery. Mixed with the traditional use of both brewer’s and distiller’s yeast, these are the raw ingredients making Benromach's Single Malt Whisky. With absolutely no computers or even pressure gauges, the three distillers manage the entire process by how the developing spirit sounds, smells and feels, giving things a tweak here and there. Nose: beautifully balanced sherry aromas with vanilla pod, zesty orange and spicy ginger complemented by delicate chamomile and menthol notes. Palate: there’s luscious, rich fruit cake with stewed plum, red apple skin and the sharp edge of kiwi fruit. With water, the whisky shifts into another gear with subtle hints of cocoa, nutmeg and cinnamon giving way to sweet honey notes and hints of bonfire embers. Finish: a very satisfying palate with traces of charred oak complementing sweet tangerine, plum and nectarines completed by a gorgeous touch of milk chocolate.